Garden strolls, a day at the Arboretum, visiting the Farmer's Market. . . all such outings deserve a stole like this that can keep you lookin' hip and stylish, and chase away any chill in the air. A trio of stitch panels, each interesting in its own right, combine beautifully to run the length of this stole. The different stitches complement each other and harmoniously create a handknit piece that will earn many oohs and aahs. Knit this up, as I did, in a gorgeous heathered green and you will have a lovely piece that perfectly transitions your wardrobe from summer to fall and beyond. Ribbed edgings are knit-in for a smooth, finished border. This is a piece that is both feminine and tailored, making it a great option to add to your weekend or office looks. 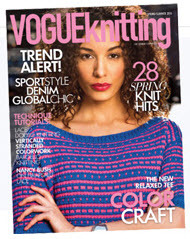 As mentionned in Vogue Knitting Spring/Summer 2015 - page 18! Yarn Used: Berroco Ultra Alpaca (50% Alpaca, 50% Wool; 3.5 oz [100 g]; 215 yds [198 m] per hank): 3 hanks in Lichen Mix #6299. NOTE: The Stole size uses almost all 3 hanks, so be sure to match the gauge. Pattern Gauge: 14-st Banana Tree panel = 3" [7.5 cm] wide; 24 rows = approx 4" [10 cm] in Rev St st and Banana Tree. Total Yardage Required: 645 yds [594 m]. Result is really beautiful and gives a very comfortable yet elegant piece that you can throw around your shoulders very easily. The different patterns add a little challenge to the knit. Overall, excellent pattern and great result. Love it.